With all the construction that’s been going on in South Jersey, you would think we didn’t just now begin coming out of a recession. But several major entities in South Jersey are expanding despite a down economy and are finding ways to use the recession in their favor. Local economists say this improvement is just the jumpstart this area needs. “From the standpoint of construction activity ramping up, and especially in industries like health care, that’s going to be a boon for the state,” says Wells Fargo economist Anika Khan. Construction actually started and finished during tough economic times in Camden where the Cooper Medical School of Rowan University opened in August. With support from legislators at the state and local levels, founding Dean Paul Katz admits the undertaking was “a bold move,” but calls it an investment. “They understand the economic engine that a medical school can be,” Katz says of those involved. “These are definitely tough times in higher education, but I think the state is looking ahead and can see coming down the road there is going to be a payback on this.” The $140-million, 200,000-square foot medical school recently welcomed its first class. Katz says the medical school has a “threefold” return: it helps Camden economically by bringing people into the city; it creates jobs not only for the staff but also for students; and there’s a huge impact on consumer goods. 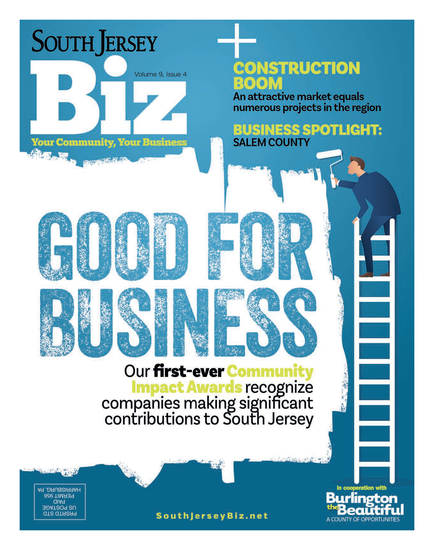 “These initiatives offer an additional benefit of potentially paving the way for the region to take a larger part in New Jersey’s drive to advance the state’s biotechnology and related industries,” he adds. Construction on Camden County College’s $30 million science building reached a milestone last fall—a topping off ceremony was held, a good-luck and goodwill gesture that marked one-year since groundbreaking. The Science Building is more than 70 percent finished and is expected to be ready for occupancy by the end of the year, according to Susan Coulby, Camden County College spokeswoman. The project actually came in under budget, she adds. Officials at the college were looking to bolster their science program and expand their presence in South Jersey. Coulby says the expansion would become “one of the major focal points” of the Blackwood Campus. Construction is still ongoing for Rowan Boulevard, which aims to be more than just the new roadway to reconnect Rowan University in Glassboro to the borough’s downtown. As the largest municipal development project in the state of New Jersey with a price tag of about $300 million, the project creates more student housing, retail outfits, restaurants, arts and entertainment buildings and more. Heather Simmons, a freeholder in Gloucester County who works in public relations for Glassboro, says $100 million worth of that construction was done during the pit of the recession. “That meant job creation and new retail,” she says. Just recently, the Whitney Center, a mixed-use building featuring retail space and Rowan honors student housing that sits right on Rowan Boulevard, officially opened. And the borough is gearing up for another huge construction undertaking on the project: a 104-room Marriott Courtyard Hotel and restaurant/conference center. A second mixed-use building will also be constructed with retail on the first floor and Rowan’s College of Graduate and Continuing Education above. Behind that building, a multi-tiered parking garage with more than 1,000 spaces can be used for hotel guests, Rowan student residents and Rowan Boulevard visitors. Ground broke last summer on the $96 million Virtua Health & Wellness Center in Moores­town at the intersection of Young Avenue and Centerton Road, right in the middle of the very busy commercial area that includes Target, Wegmans, Costco and more. This wellness center—slated to open later this year—also joins a second wellness center on the campus of the newly built Virtua Voorhees hospital. The Voorhees hospital itself, a 680,000-square-foot medical center, opened in the spring of 2011 with its adjacent wellness center set to also open this year. Officials associated with the project have said this gives a boost to the economy not only in the 300 temporary construction jobs at the Moorestown site, but for the 300 permanent jobs for the center itself once development is complete. It’s a Midwest developer, not Virtua itself, that’s taking a chance with the cost and construction of these wellness centers, but President and Chief Executive Officer Richard P. Miller says the interest had to be there for local physicians to lease space. So, the desire to expand, especially in tough economic times, was there. And as Khan says, the demand for health care continues to grow. Michael Dolega, an economist with TD Bank Group, says education and health care have become increasingly important to the regional economy, while other sectors have declined. “Capital projects are welcome news,” he says. Camden County Freeholder Ian K. Leonard recently acknowledged very little construction is taking place in the nation, making South Jersey’s activity all the more striking. “It’s truly amazing when you see projects like this, especially in this economy,” Leonard says. Gloucester County Freeholder Director Robert Damminger says he’s seeing bigger businesses—not only just construction projects—calling South Jersey their homes. Top companies like gluten-free retailer Schar USA, Taylor Farms and Transmar Group, a cocoa supplier, are setting up in Gloucester County. Published (and copyrighted) in South Jersey Biz, Volume 2, Issue 9 (September, 2012).